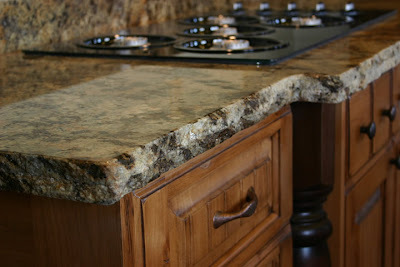 Lapidus is a really pretty & popular granite color....especially here in Utah! BJ & I actually both have Lapidus in our own kitchens. We'll have to show you photos of our own homes one of these days. Anyway, I just wanted to show off this edge detail. It's called the Chiseled edge detail. It is also very popular here in Utah. It is generally used in more rustic & mountain designed homes. Though it does add a fun texture that some people have even used in more contemporary design. At MGS by Design we take special care with the Chiseled edge to give it the rough look without the rough feel, we don't want it to snag your sweater!